For musicians enjoying the crisp note delivery of the Oregon Concert and wanting to play at the top of the fretboard, Breedlove has added the Oregon Concert cutaway. 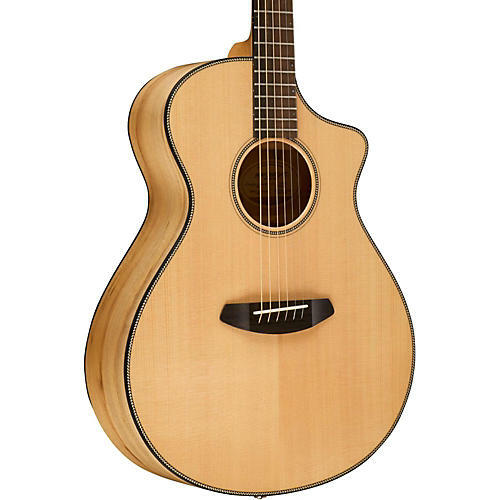 Crafted with Breedlove’s comfortable and accessible soft cutaway design, this model invites you to utilize every note on all 20 frets. The Breedlove Concert is the original Breedlove shape. It first appeared in 1992, and has been the best- selling Breedlove body shape ever since. Designed specifically for the fingerstylist to be well balanced, compact, and comfortable to play, it generates a wonderfully articulate range of tone with an ample low end that is never boomy, but always felt. The unique construction also allows the Concert to sing even at a full strum. If you’re a fingerstylist, or are seeking an instrument to use as vocal accompaniment, this is the shape for you. The Concert is engineered to provide exceptional sustain with a pronounced bass response, both of which can be achieved with a light touch. Breedlove guitar necks feature a slimmer neck profile, which enables comfortable play, even with smaller hands. Unlike traditional dovetail neck joints that require major surgery for a neck re-set, it is easy to adjust the play action and neck angle with the Breedlove bolt-on neck and single-action truss rod. The hand- rubbed, semi-gloss Breedlove neck finish contributes to ideal playability – the finish process alone takes three days, including precise finish coat applications, fine sanding, and hand buffing and rubbing.